Boca Isles South is a pet-friendly community in Boca Raton FL, in what is commonly referred to as West Boca. It’s a beautiful planned community of single family homes along tree-lined streets and lakes. It is the sister community to Boca Isles North. It is not uncommon to see neighborhood kids playing in the streets, at the clubhouse or people out walking their dogs among the swaying palm trees. Lot sizes in Boca Isles South run about one-quarter of an acre. These are full-size lots as opposed to zero-lots. Boca Isles South and Boca Isles North are guard-gated all age communities. Boca Isles South in Boca Raton FL was built by Lennar Homes beginning in 1994 with the last homes being delivered in 1996. Since that time, many of the homes have been updated. The homes for sale in Boca Isles South range between 2000 and 3000 square feet. Many have their own private swimming pools. The smallest homes in the neighborhood start with 3 bedrooms while the larger floor plans have 4 and 5 bedrooms, with some models putting the master bedroom on the first floor. Amenities at Boca Isles South include a manned-gated entry, clubhouse with pool and spa, exercise room, game room, basketball, tennis and an on-site. 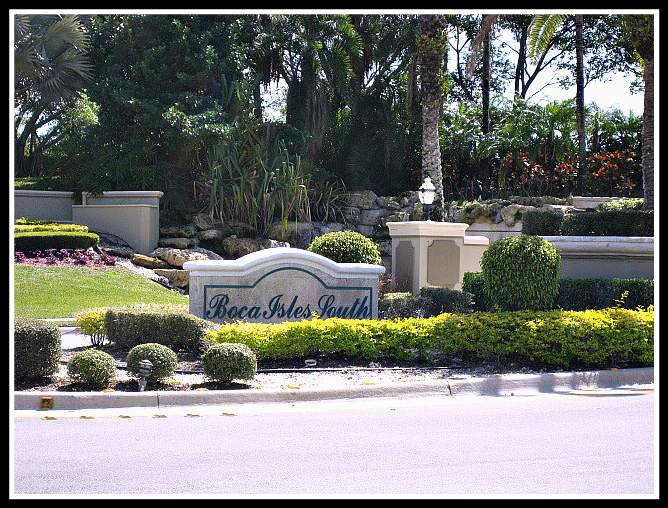 Boca Isles is a guard-gated, all age community. What’s Going on Near the Boca Isles Neighborhood? Boca Isles South has a good location in West Boca. There is just about every kind of conceivable shopping within close proximity to the community from grocery stores, pharmacies, banks, pet supplies, Best Buy, Fresh Market, Home Depot, Bed, Bath & Beyond and more. There are four major shopping centers within minutes of the community. West Boca Medical Center, a major hospital, is less than one mile from the community. In the evenings you may want to take in a movie (there are movies in the shopping center too) after enjoying dinner at Villa Rosano or Ben’s Deli. Villa Rosano is one my all-time favorites! During the day, you may want to take the dogs to Canine Cove Dog Park at South County Regional Park which has, among many other amenities, a water park, golf, an amphitheater, fishing and a nature center. If you buy one of the pet-friendly homes for sale in Boca Isles South, the local schools serving this area are Sunrise Park Elementary School, Eagles Landing Junior High, and Olympic Heights High School. To get local school scores and more information about these schools check out the Palm Beach County Schools website. Have a question? Go on. ASK ME! Now You Really Want to Find a Home Here, Right? If you are interested in the current homes for sale in Boca Isles in Boca Raton FL click on the link. For more information about pet friendly homes and communities or Boca Raton Real Estate, please contact me. I am a Boca Raton Real Estate Agent and can be reached at (561) 716-7824, by text or by email at [email protected]. All information and measurements deemed accurate but not guaranteed.